The scene was President Kennedy’s forty-fifth birthday bash at Madison Square Garden, and Life photographer Bill Ray wanted to find a unique angle. He surreptitiously broke away from the police-cordoned press pod and climbed up above the stage. When Marilyn Monroe walked into the spotlight to sing her now-famous rendition of “Happy Birthday,” Ray had a perspective nobody else got, above and behind the sparkly dressed star. It was just one of hundreds of singular images made by the photographer, a sampling of which opens in a newly curated exhibit at Monroe Gallery of Photography on Friday, Nov. 28. Ray was born in Shelby, Nebraska, in 1936, a few months before the first copy of Life magazine hit the stands. He started as a staff photographer at the Lincoln Journal Star the day after graduating from high school. At seventeen, he photographed President Dwight Eisenhower and Vice President Richard Nixon, who were visiting Nebraska. During that time, he had the opportunity to meet Gen. Curtis LeMay. It was a foreshadowing of a career full of celebrity encounters. He went on to work for United Press International in Chicago and for the Minneapolis Star and Tribune.Then, in 1957, he turned down a job with National Geographic to begin freelancing for Life. He was soon a staffer working out of the magazine’s New York, Beverly Hills, and Paris bureaus. In his 2007 photo-filled biography, My Life in Photography, Ray says it could also have been titled “My Life With Marlys,” after the woman he met in 1956 and married in 1958. She has been an invaluable assistant — and his agent, ever since Life folded in 1972. The many subjects in Ray’s portfolio include a newly enlisted Elvis Presley about to board a troopship bound for Germany; John and Jackie Kennedy in the early 1960s, and Jackie and Aristotle Onassis later that decade; a stunning close-up of actress Natalie Wood; a fierce Muhammad Ali in the ring; George Harrison and Bob Dylan singing at the Concert for Bangladesh; baseball star Roger Maris at bat; Roman Polanski and Sharon Tate strolling along a London street; a series on Ronald Reagan and his family; and candids of artist Isamu Noguchi and cartoonist Charles M. Schulz. Ray also did two Army tours as a photographer in Vietnam. 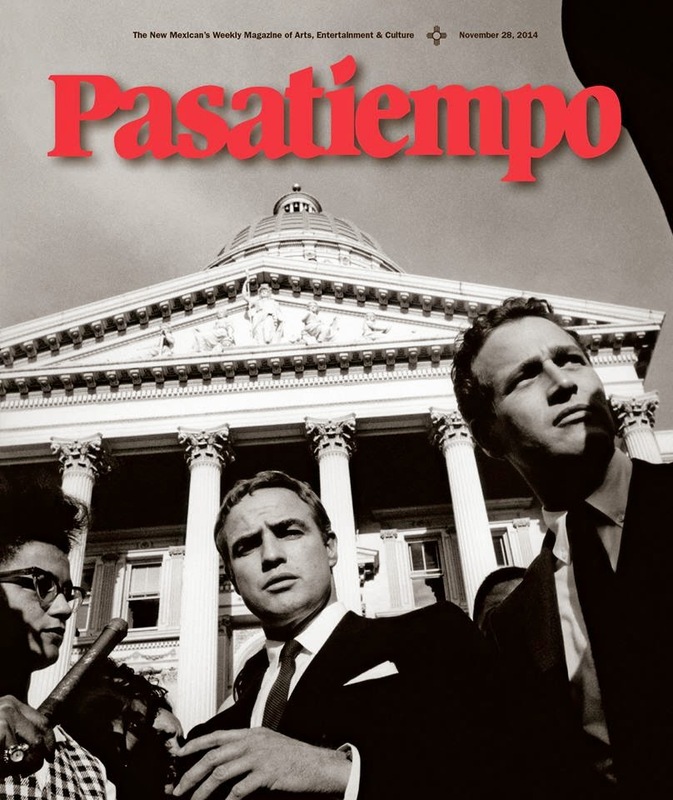 Pasatiempo: Early on, your mother supported your desire to be a photographer, isn’t that right? Bill Ray: She did. She was quite a character. Both my parents were just perfect. I had a terrific childhood. My mom was very busy with her art and loved the idea of my pursuing something like that. We were not by any means wealthy, but she always found money if I needed a camera. Pasa: Your main role model was Alfred Eisenstaedt. Why him? Ray: It was just from reading Life magazine and having a passion about photography. I loved growing up as a kid in a tiny little town, but as I got older it was clear that I wanted to get the hell out of there. My dad would have given me the lumberyard he owned, but I didn’t want to sell two-by-fours. I had a passion about going to New York and Life magazine. Fred Astaire was from Omaha, and when I saw him dance [in a movie] with Cyd Charisse in Central Park, that was it: I’m going. Pasa: A lot of what you did were sort of Johnny-on-the-spot news assignments covering things like a Muhammad Ali fight or Nikita Khrushchev visiting a farm in Iowa. Ray: That’s right, but I also originated a few ideas. For example, in 1959, there was a little story in the paper — every morning when I got up, I’d grab The New York Times,The Wall Street Journal, the Daily News, the [Daily] Mirror, and whatever else I could get my hands on — and there was a little story about a bunch of people in Detroit who were going to Alaska to homestead. I rushed over and showed the picture editor the story, and he said, “Go ahead, go.” I was very enthusiastic and worked very hard on every assignment. You have to be intense and keep going. That’s the only way to keep the assignments coming. Pasa: It was pretty competitive? Ray: Oh, god, at Life magazine, yeah. Everybody in the world wanted to work there. Pasa: You used many different kinds of cameras. To shoot Andy Warhol, you had a giant Polaroid camera, and on the other end of the spectrum there’s a picture in the book of you at age eleven, concentrating on the viewfinder of a Speed Graphic. Ray: That’s when I belonged to the Omaha Camera Club. The tiny village I grew up in was 90 miles away, so we’d go into Omaha once a week. It’s there that I met my mentor, who was a brilliant commercial photographer. He really got me on the right road to how photography technically works. The Speed Graphic was the basic tool at the newspaper I started working at when I turned seventeen in May 1953. I had a Leica and a Rolleiflex and a Linhof, but you really had to use the 4 x 5 [medium-format camera] to make the deadlines. Pasa: I would think the bigger camera with the film holders was slower than a 35-millimeter camera. Ray: But for most assignments, you shoot just one or two holders [two shots in each holder], and you come rushing in and soup [develop] that, and you can print a 4 x 5 negative wet. Pasa: I read that Marlys always traveled with you and loaded the cameras. Ray: Yeah, and she was the fastest there was at loading a Hasselblad, and she always kept the film straight. You have to know which roll is which, because I would say, “We’re going to push this roll a half [in development time to increase contrast],” or whatever. Under pressure, you have the president or Moshe Dayan and only a limited amount of time, so you really shoot like hell. We traveled a lot. We spent months in Japan, and we traveled for about 10 months with Carl Sagan around the world. Pasa: Sid Monroe at the gallery told me that Life never ran the photos you took of the Hells Angels. Ray: The story was killed by the managing editor. I heard that he said, “I don’t want these smelly bastards in my magazine.” And that was after I worked on it a month. The thing about the Hells Angels is that they are now very popular. Marlys and I found those negatives and got them online, and the emails from all over the world are astounding. Pasa: Your abilities show up in composition, people’s expressions and body language, and lighting — and most of what you did for Life was shot in ambient light. Ray: That’s right, although I did almost 50 covers for Newsweek, for example, of Luciano Pavarotti and Itzhak Perlman, and those were all strobe. Another thing about the technique is that in those days — it seems so long ago now — you had to focus and you had to have the right exposure. Even though this digital revolution is truly a revolution — it’s just so huge it’s hard to comprehend — the basics, lighting and composition, are so important. Be it as a staffer for LIFE or a would-be one for National Geographic, documenting the likes of Marilyn Monroe singing “Happy Birthday” to President Kennedy or riding along with the Hells Angels, New York-based Bill Ray is part of the elite who shone during the 1960s and ’70s with their impeccable timing and groundbreaking approach to photojournalism. On Friday, Monroe Gallery of Photography polishes off his archive and presents a comprehensive retrospective on his stunning works, several of which resonate particularly now, thanks to a poignant mix of nostalgia, superb, often on the fly technique and the current obsession with all things celebrity culture. “It was very busy and hectic as you would expect, but that was the norm,” Marlys, Ray’s wife of 56 years, tells SFR over the phone during what ended up being her first interview. Bill was off delivering prints to the lab. Bill and Marlys’ love story would develop alongside his globetrotting work. More trips, accolades and encounters with the personalities of the time would follow. Ray’s roster includes iconic images of Elvis Presley, Natalie Wood, Ella Fitzgerald and Andy Warhol, whom Marlys met. Reflecting on the impact of Ray’s images and the long legacy of those pictured in them, Marlys says, “They just keep going and people love them.” Back from his errands, the photographer would later email SFR singing his wife’s praises. Today, President Obama is presenting the Presidential Medal of Freedom, the county's highest civilian honor, to a number of people, like economist Robert Solow, actress Meryl Streep, musician Stevie Wonder, choreographer Alvin Ailey (in a posthumous honor) and composer and lyricist Stephen Sondheim. But three people are not celebrities, notable scientists or politicians—they were three young men who were murdered while registering black voters during the "Freedom Summer" of 1964. James Chaney, Andrew Goodman, and Michael Schwerner were civil rights activists and participants in “Freedom Summer,” an historic voter registration drive in 1964. As African Americans were systematically being blocked from voter rolls, Mr. Chaney, Mr. Goodman, and Mr. Schwerner joined hundreds of others working to register black voters in Mississippi. They were murdered at the outset of Freedom Summer. Their deaths shocked the nation and their efforts helped to inspire many of the landmark civil rights advancements that followed. Chaney, from Mississippi, and Goodman and Schwerner, of New York, were traveling in Philadelphia, Mississippi, to investigate the burning of a black church, when they were arrested for speeding. They were, the NY Times reports, "slain after their release from jail in what is believed to have been a Ku Klux Klan ambush. Their bodies were found 44 days later buried in an earthen dam." Their deaths are "widely seen as helping inspire the historic civil rights march from Selma to Montgomery, Ala., in 1965, and the passage of the Voting Rights Act the same year." The men who shot and buried the three were convicted of civil rights violations, but not murder. In 2005, Mississippi State Attorney General Jim Hood revisited the case and tried Edgar Ray Killen, considered the ringleader in the murders. Killen was ultimately convicted of manslaughter, but not murder. During Killen's trial, Goodman's mother read a postcard her son, an Upper West Sider who had been a student at Queens College, sent to her on June 21, 1964, the last day of his life, "Dear Mom and Dad, I have arrived safely in Meridian, Miss. This is a wonderful town, and the weather is fine. I wish you were here. The people in this city are wonderful, and our reception was very good. All my love, Andy." Killen, 89, is serving a 60-year prison sentence. A four block stretch of the Upper West Side, west of the West End Avenue, was carved out in 1967 to created "Freedom Place," to pay tribute to Chaney, Goodman and Schwerner. A plaque pay tribute to their how the men gave "their lives in the unending struggle for freedom and democracy." Joe McNally Photojournalist Exhibition at the Monroe Gallery of Photography in Santa Fe, New Mexico, October 3 - November 23, 2014. See the video of a 30 year retrospective of Joe McNally's diverse and dynamic images. Joe reflects on the passage of time, and Sidney Monroe discusses collector's rising interest in photojournalism as a fine art. View the exhibition images here. 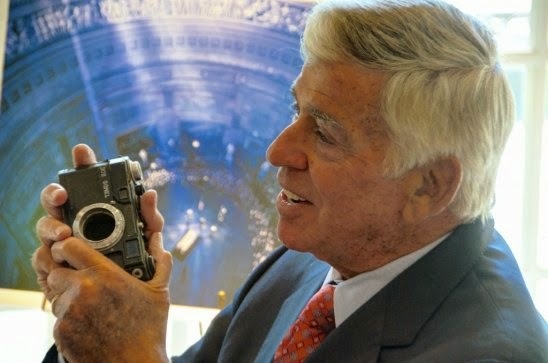 Bob Gomel poses with one of the cameras he used while covering pop culture for Life magazine in the 60s Slide show here. EDITOR’S NOTE: Last year as the 50th anniversary of the assassination of John F. Kennedy loomed, The Texican visited with noted photographer and Houston native Bob Gomel at his home in the Memorial area to talk about his career behind the lens. Gomel captured some of the most poignant images of the funeral of the slain president that the world would ever see. It was an especially sad assignment for Gomel, who once spent an afternoon with Kennedy watching football while he was on the campaign trail. With the 51st anniversary on Saturday, here’s a look back at that profile of Gomel, 81, who still keeps busy globetrotting with his trusty collection of cameras. As a Life magazine photographer in the ’60s, Bob Gomel saw some of the most pivotal moments in pop culture history through the lens of his Nikon. A hallway in his Memorial home is lined with crisp, perfectly matted and framed shots that he snapped of Muhammad Ali, Marilyn Monroe, The Beatles, Richard Nixon, and Dustin Hoffman. Each photo comes with a rich story from Gomel that leaves the listener with a perma-grin. But it is Gomel’s most celebrated subject, President John F. Kennedy, that has brought him the most notoriety — and the most sadness. Capturing the funeral of a man he had grown personally close to was not in his plan. There was an afternoon late in 1960 when then President-elect Kennedy, Gomel, and another photog spent a few rather normal hours together that he’ll always remember with great pride. “Kennedy was working and living in a brownstone in Georgetown picking out his cabinet for his first term,” says Gomel, who was waiting to capture the first shots of newly appointed cabinet members. It was slow going some days. Men in suits would come in and out, with little or no word to the press. “There was just two of us left outside on a cold, dreary Saturday afternoon, so Kennedy invited us inside to watch the Army-Navy football game,” he says. That other man was noted Washington news photog James Atherton, no slouch in his own right. Atherton passed away in 2011. They went inside and TV trays were brought out. Kennedy, Gomel, Atherton, and some Kennedy staffers ate steak and baked potatoes and watched the game. “The next thing I remember is Jim waking me up, telling me that Navy won and that I fell asleep on the president,” Gomel says. From then on Kennedy would always have fun with him about it. Gomel’s photographic journey began at 11 years old, when he delivered groceries on his bicycle for one hot summer in the Bronx, making just enough cash for a Circoflex camera. It cost him $88 — not a small chunk of change in 1944 — but what he wanted more than anything was a camera of his own that didn’t belong to his parents. He wanted to explore the world with a lens, even if it was just the Bronx. After graduating from New York University, a hitch as a Navy pilot during the tail-end of the Korean War only made him yearn for a life behind the lens even more. Gomel left Life at the end of 1969 and opened up his own studio in Manhattan. He did commercial work for the likes of Audi, Shell, Pan Am, Volkswagen, and Merrill Lynch before heading to Houston in the late ’70s to to take part in the oil boom. Now 80 years old, the Manhattan-born, Bronx-raised and proud Houstonian of nearly 40 years hasn’t slowed down a bit, and neither has his trigger finger. When I spoke with him on a sunny afternoon this week, he was giddily telling me about one of his upcoming, month-long photography trips to South India. The hubbub surrounding the 50th anniversary of the assassination of Kennedy means that there are new documentaries, news packages, and online and print stories to resurrect old feelings. Men like Gomel that were on the front lines of history aren’t so cynical about the situation. He was in New York when he found out about the assassination in Dallas. He showed up to work at the Life offices to find that everyone who was on staff was ordered to leave immediately for Washington. “There was no time to even pack a toothbrush,” he says. He got into Washington, D.C., on the morning of Nov. 23, just in time to arrive at the White House to see the president’s body being brought back home. From then on, Gomel was shooting everything in front of him. The mood that week still makes him shudder. The stun in everyone’s eyes, the disbelief and shock was surreal. “We hadn’t experienced anything like that in our lifetime; it was a series of shocks. It was more than we could comprehend at one time,” he says. Couriers picked up film every hour to fly it back to New York to get it developed. Sleep was a rarity. Gomel’s shot of Kennedy’s casket lying in state in the U.S. Capitol rotunda as thousands upon thousands filed in to pay their respects is haunting in its simplicity and scope. The blue hue came from some intervention from the man upstairs, he says. He had been down on the main floor but decided to explore the potential of the balcony above. He found a door that had access and he went up there. He would shoot from nearly the same vantage point for President Dwight D. Eisenhower’s funeral in March 1969, but from much higher in the rotunda. The graveside services for Kennedy at Arlington National Cemetery on Nov. 25 featured dozens of heads of state from around the world. There was Charles de Gaulle, Haile Selassie I, Chancellor Ludwig Wilhelm Erhard, and Gomel, somehow right in the mix. He wasn’t exactly supposed to be that close to the world’s leaders. “I learned only recently at a Life magazine reunion that we didn’t even have credentials for Arlington National Cemetery,” he laughs. The Life staff had rented a limousine for the funeral and were accidentally put into the official motorcade with all the heads of state. “I had a front row seat,” Gomel says. His photo, with de Gaulle solemnly saluting the casket of Kennedy and the others looking on in reverence, shows just how packed Kennedy’s service was. He estimates there are 60-plus dignitaries in the photo. Somewhere there is a list of everyone shown. Getting the best shots sometimes had to come by hook or by crook, on boss’s orders. “We had to find a way to get pictures. We had an admonition from our editor to not come back with just excuses,” he says. During the viewing and funeral, Gomel found himself putting aside his personal relationship with Kennedy for work. He was 100 percent concerned with reporting it and capturing all the details with his camera. “I had to disconnect from my association with the president and the fact he knew my name,” he says. Gomel was in Houston with the president when he made his famous Moon Race speech at Rice University in September 1962. You can spy the photog in the background of a picture of Kennedy here in town, too. Gomel captured a candid shot of Kennedy climbing out of a space capsule at NASA, which he’s extremely proud of. It’s in his home gallery, and one of the first photos you see when you come into his house. It’s symbolic of the country finally making it to the moon, just as Kennedy wanted. After the 50th anniversary specials and tributes die down after Nov. 22, Gomel will continue to reflect on what he was a part of all those years ago. This fall he’s been a busy man, recounting a week of his life 50 years ago, a week that he wishes he wouldn’t have played such a small, but every important role in. Gomel was on a team of Life photographers tasked with capturing every step of Kennedy’s funeral in November 1963. Gomel was all of 30 years old, thrust into an American nightmare, and assigned to document it all for folks at home. The somber proceedings threw a dark shroud over the country, but Gomel had to keep snapping photos. The fact that the slain president actually knew his name after years of Life coverage made the situation all the more harder for Gomel, who had been orbiting around Kennedy since before he was even elected president. Joe McNaIIy, Yellowstone - Walkway in the Fog, 2006. Being at the right place at the right time is a photographer's modus operandi, and photojournalist Joe McNally has had his share of right-place, right-time moments; moments that have resulted in memorable, if not iconic images. In a retrospective of the photographer's work - on view at Monroe Gallery of Photography in Santa Fe through November 23 - more than 45 images stand testament to McNaIIy's discerning eye, both in formal and candid situations. Photos in color and black and white dating from 1978 to 2013 feature subjects of a most eclectic nature not typically associated with one photographer. But given a 30-year career in which McNaIly has contributed to TIME, Newsweek, Fortune, The New York Times Magazine, National Geographic, and LIFE, among others, it is little wonder that his portfolio runs the gamut in terms of subject matter. This includes sports, politics, music, science, portraiture, the natural and urban landscape, and war. lnterestingly, McNaIIy carries the distinction of being the last staff photographer for LIFE, whose pages, over the years, were filled with photographs by Alfred Eisenstaedt, John Loengard, Carl Mydans, Gordon Parks, and W. Eugene Smith. Among the pictures on display are eight life-size portraits by McNaIly of individuals impacted by the events of 9/11 taken just days following the horrific attack. lncluded are former mayor of New York City Rudolph Giuliani and New York firefighter Joe Hodges, each part of McNally's larger document called Faces of Ground Zero, which traveled around the country and spawned a book by the same title. The one-of-kind, 80 x 40-inch Polaroid photos are mounted on freestanding stanchions placed down the center of the gallery. Whereas each picture by McNally holds a newsworthy narrative, a few nudge into fine art, like Yellowstone— Walkway in the Fog, 2006, in which an unoccupied walkway emerging from the bottom center of the composition curves gently to the right leading the viewer into an otherworldly environment of shimmering, copper-colored mineral water and fog-shrouded background. In the upper left corner is a snow-covered rise where barely visible trees appear like scratchings upon the photographic surface. History-making events and sheer beauty are fully captured through McNally's lens. John Doar, who was a leader in the federal government’s legal efforts to dismantle segregation in the South during the most volatile period of the civil rights movement in the 1960s, and who returned to government service to lead the team that made the constitutional case for the possible impeachment of President Richard M. Nixon, died on Tuesday at his home in Manhattan. He was 92. He escorted James Meredith onto the campus of the University of Mississippi in 1962, even as then-Gov. Ross Barnett and angry crowds sought to keep the school segregated. Doar later was the lead prosecutor in the federal trial arising from the deaths of three civil rights workers, Andrew Goodman, James Chaney and Michael Schwerner. Those killings inspired the 1988 film "Mississippi Burning."